Survey for Wha's Like Us ? Stirling Council's Libraries, Information and Archives are in the planning stages of Wha's Like Us? - a family history event in 2014. They are planning a fun interactive event that will give attendees a chance to meet other people interested in family history research and will include a lively selection of talks and workshops by local and national experts, aimed at unearthing the stories and experiences of this kind of research. Answering the Wha's Like Us? survey commits you to nothing but offers you the opportunity to get details of the event via email. This year, come to our Migration themed Conference on 11th May 2013 in Galashiels, Scotland. There’s a new charitable organisation, Ireland Reaching Out, set up by the Irish government to boost tourism (or as they say to welcome home the Irish diaspora to their ancestral parishes) by encouraging people of Irish extraction to find out about their roots. One of their main aims is to identify people who left Ireland, and trace them and their descendants worldwide and their other main aim is to help people researching their Irish ancestry to find an elusive gravestone, the location of their ancestor’s dwelling, make contact with living relatives or discover more about a community. They’ve recruited an army of volunteers covering over 500 Irish parishes and they’re offering their services free but they offer the opportunity to make a donation too. It’s organised at the parish level so you need to know which parish an ancestor came from, and then you can register and add details about the ancestor that you want to research. 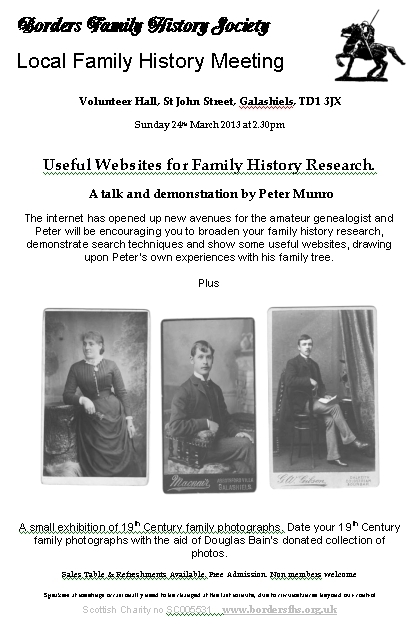 There are links to family history societies, archives, and other resources. Whatever the origin of your roots, find out more from the exhibitors at our family and local history fair on 11th May 2013 in Galashiels, Scotland.